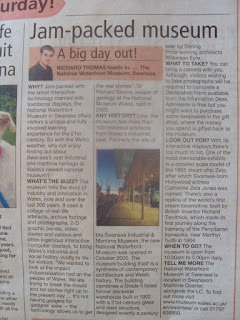 Below is my “Big Day Out” column from the Saturday, June 25, 2011, Swansea edition of the South Wales Evening Post. Located on the A4118 in the heart of the Gower overlooking the stunning Oxwich Bay, Perriswood Archery and Falconry Centre is only a 20 minuet drive from Swansea. The centre provides a range of activities that can be enjoyed by individuals and groups of all ages. Whether you are looking to try something new; relax and take in the surrounding scenery; have fun with the family; or celebrate a special occasion ... Perriswood is a good place to visit. Archery lessons are available all day everyday on the centre’s outside range, or inside if the weather is not good. The lessons are suitable for the whole family from 6 years old up and for all abilities. At the end of an hour lesson you get the chance to win a solid gold, Celtic design ring! All you have to do is shoot an arrow into the centre of a ring on your target. There are also 38 different birds of prey to see at Perriswood, including owls, hawks, and falcons. And visitors get to hold the birds for themselves. You even get the chance to see one fly to your own gloved hand! Very few falconry centres let members of the public so close to their birds, setting Perriswood apart from other centres. For a more relaxing option you can enjoy a herbal tea or freshly ground coffee with a cake in the Perriswood coffee shop. You can also take a look around the rest of the centre’s animal attractions, including monkeys, micro pigs, honey bees, and others. Brian Williams and his family have lived at Perriswood Farm for over 200 years. In 2004 Brian decided to diversify into teaching archery. The centre originally started off with seven bows and two targets in one of the fields. Over the last seven years the centre has developed and today Perriswood can have up to 80 people shooting at one time! By spring 2007 it was decided that changing the way that archery is taught wasn’t enough and Brian struck out to bring birds of prey to the masses. The centre offers visitors three different length lessons. A 15 minute archery lesson costs £6.00, and 30 minuets costs £8.00. An hour lesson costs £14.00. Whereas “Arrows, Talons & Tea” costs only £12.00 per person. If you would like to try archery and falconry then “Arrows, Talons and Tea” is the best package. An introduction to archery is followed by a hot drink and cake before you take part in a bird display. Perriswood is open seven days a week. Their opening hours are 10.00am to 7.00pm. You can contact Perriswood and find out more via their website at www.perriswood.com or phone on 01792 371661. Their address is: Perriswood Farm, Penmaen, Gower, Swansea, SA3 2HN. Below is my “Big Day Out” column from the Saturday, June 18, 2011, Swansea edition of the South Wales Evening Post. the Egypt Centre in Swansea. With the popularity of films like “The Mummy” and its sequels, why not take the family to the Egypt Centre at Swansea University and discover for yourself the facts behind the fiction. Find out about the real Imhotep, high priest of the sun god Ra and architect of Ancient Egypt’s first pyramid. You can also see for yourself a real life Egyptian coffin, as well as other ancient exhibits from the land of the Nile! Located within the Taliesin building at Swansea University, the Egypt Centre is the only museum of Egyptian antiquities in Wales. The Centre is open to the public and also welcomes school parties and groups from early years, primary and secondary to graduate and post-graduate and special needs students. To book you can Email Wendy Goodridge at w.r.goodridge@swansea.ac.uk. The Egypt Centre opened in 1998, but its roots are much older. Most of the objects in the Centre were part of the collection of the 19th and early 20th century pharmacist and archaeologist Sir Henry Wellcome, who collected them from excavations. There are over 4500 items in the collection. Egypt Centre staff have published over 100 online pages concerning individual items, which you can find on the Egypt Centre website at: www.swan.ac.uk/egypt The funerary items on display in the “House of Death” are one highlight. These include amulets, shrouds, statues, coffins and fragments of coffins, and even canopic jars, which were used by the Ancient Egyptians to store and preserve the internal organs of the deceased for their journey through the afterlife. Bring a camera with you. Admission is free but you might want to visit the Egypt Centre Shop located in the foyer of the museum, where you can buy some keepsakes. Some of the more unusual gifts available include books of Egyptian spells and curses, as well as a wide range of statues, recycled glass, papyrus from Egypt, and exclusive hand-made jewellery. More conventional items like pens, pencils and key-rings are also available to buy. The Egypt Centre is open Tuesday to Saturday 10am to 4pm. Please note that the Centre is not open Sundays, Mondays or bank holidays, and will be closed for the Christmas holidays from 24 December to 4 January. You can also telephone on: 01792 295960 or Email the curator, Carolyn Graves-Brown at: c.a.graves-brown@swansea.ac.uk. Below is my “Big Day Out” column from the Saturday, June 11, 2011, Swansea edition of the South Wales Evening Post. Oakwood Theme Park in Pembrokeshire. With over 30 rides and attractions including three roller coasters and four water rides, Oakwood Theme Park in Pembrokeshire attracts 400,000 visitors each year, making it one of the UK's top ten theme parks. So with Oakwood re-open for the new season in early April, why not check it out? Located off the A40 motorway at Canaston Bridge, 8 miles east of the town of Haverfordwest, Oakwood park provides fun for all the family, from white knuckle rides to dazzling firework displays and other special events Oakwood has it all. Also other family attractions including Fully Farm and Scolton Museum can be found near Oakwood Theme Park, just six miles away. Oakwood Theme Park first opened in 1987 as “Oakwood Leisure Park”, a very small family park with BMXs, a wooden fort, a 3D-style cinema experience show, go-karts and a water chute ride. In 1996 Oakwood’s status as a small-scale regional attraction was completely transformed when the park opened “Megafobia” to the public. At that time Europe's largest wooden roller coaster ride. Since then the park has acquired a worldwide reputation for innovation and has since incorporated four more large thrill rides: “Vertigo”, “Bounce”, “Hydro” and the park’s newest roller coaster “Speed” opened in 2006. Standard tickets for visitors over 13 years old cost £19.95, while junior tickets for children 3-12 years old cost £14.25 each. Children two years old and younger visit the park for free and by booking online you can save £2.00 per person! Oakwood has a good variety of rides to suit all people and ages. Megafobia and Speed are the park's two most exciting roller coasters. In the Detailed Wood Roller Coaster Poll 2010 the 85-foot-tall Megafobia ranked number 30 in the world. Speed is an exhilarating ride, twisting and turning at speeds of up to 60 miles per hour. Bounce is a vertical ride, shooting you up into the air at more than 40mph. Together with the Hydro water ride, these four attractions form Oakwood’s “Big Four”, the ultimate adrenaline rush for thrill seekers! For the more wary and younger children there are also more family orientated rides, including The Pirate Ship and Snake River Falls. Oakwood is generally open 10.00am to 5.00pm daily. For more information about opening times you can visit the official Oakwood Theme Park website at www.oakwoodthemepark.co.uk. 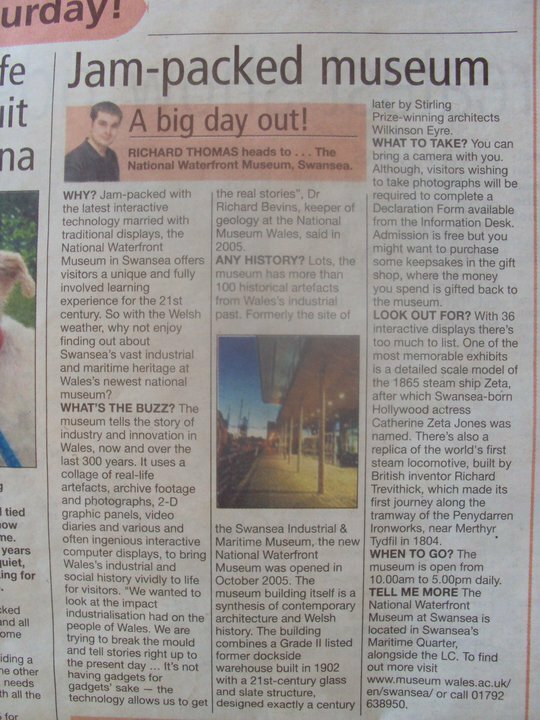 Below is my “Big Day Out” column from the Saturday, June 4, 2011, Swansea edition of the South Wales Evening Post. The National Waterfront Museum in Swansea. Jam-packed with the latest interactive technology married with traditional displays, the National Waterfront Museum in Swansea offers visitors a unique and fully involved learning experience for the 21st century. So with the Welsh weather why not enjoy finding out about Swansea’s vast industrial and maritime heritage at Wales’ newest national museum? The National Waterfront Museum at Swansea tells the story of industry and innovation in Wales, now and over the last 300 years. The museum uses a collage of real life artefacts, archive footage and photographs, 2-D graphic panels, video diaries and various and often ingenious interactive computer displays, to bring Wales’ industrial and social history vividly to life for visitors. "We wanted to look at the impact industrialisation had on the people of Wales. We are trying to break the mould and tell stories right up to the present day … It's not having gadgets for gadgets' sake - the technology allows us to get the real stories", Dr Richard Bevins, Keeper of Geology at the National Museum Wales, said in 2005. Lots, the museum has more than 100 historical artefacts from Wales’ industrial past. Formerly the site of the Swansea Industrial & Maritime Museum the new National Waterfront Museum was opened in October 2005. The museum building itself is a synthesis of contemporary architecture and Welsh history. The building eloquently combining a Grade II listed former dockside warehouse built in 1902 with a 21st century glass and slate structure, designed exactly a century later by Stirling Prize-winning architects Wilkinson Eyre. You can bring a camera with you. Although, visitors wishing to take photographs will be required to complete a Declaration Form available from the Information Desk. Admission is free but you might want to purchase some keepsakes in the museum’s gift shop, where the money you spend is gifted back to the museum. With 36 interactive displays there’s too much to list. One of the most memorable exhibits is a detailed scale model of the 1865 steam ship Zeta, after which Swansea-born Hollywood actress Catherine Zeta Jones was named. There’s also a replica of the world's first steam locomotive, built by British inventor Richard Trevithick, which made its first journey along the tramway of the Penydarren Ironworks, near Merthyr Tydfil in 1804. The museum is open from 10.00am to 5.00pm daily. The National Waterfront Museum at Swansea is located in Swansea's Maritime Quarter, and less than half a mile from the city centre. There address is: National Waterfront Museum, Oystermouth Road, Maritime Quarter, Swansea, SA1 3RD. To find out more about exhibits etc. you can visit the National Waterfront Museum website at www.museumwales.ac.uk/en/swansea or call on 01792 638950.